NFPA offers a wealth of free resources to help you educate your communities and families about the importance of safe cooking. 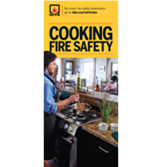 NFPA's tool kit on cooking safety includes everything you need to help you launch a cooking safely campaign in your community. People in the United States are most likely to experience a fire in their home than anywhere else. Cooking is the leading cause of home fires. Two out of five home fires begins in the kitchen - more than any other place in the home. NFPA’s toolkit on home fire escape planning includes everything you’ll need to help residents in your community make and practice a home fire escape plan. Fire can spread quickly throughout a home, leaving as little as two minutes to escape safely once the smoke alarm sounds. Making a home fire escape plan and practicing a home fire escape drill are important elements of home fire safety. NFPA has created a cooking safety infographic for you to use on your website, blogs, Facebook and Twitter. Just download the graphic and place wherever you want to use it. Please link to this cooking information page at www.nfpa.org/cooking. 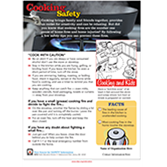 Dish up safety basics with NFPA's Cooking Safety Tip Sheets. Help reduce the number 1 cause of home fires and home injuries!